UPDATE: The product has been changed from a multi-sport NCAA release to 2016 Panini Black Gold Collegiate Football. 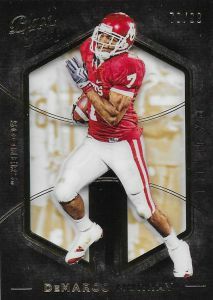 Already found with both an NBA- and NFL-specific focus, 2016 Panini Black Gold Collegiate Football sees the brand enter the world of college sports. 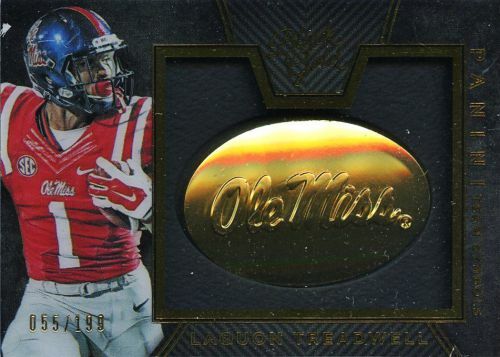 Every pack includes one on-card autograph, two additional hits, and one manufactured relic from a checklist that features top football subjects from their college days. The base set works with the PETG shadowbox design for top collegiate names of the recent and distant past. Base and parallels are numbered to 99 or less and include one-of-one Printing Plates. 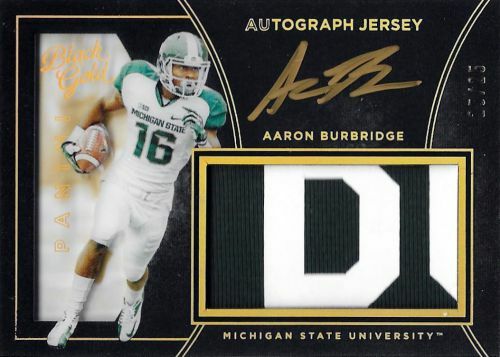 Largely featuring the two main colors, 2016 Panini Black Gold Collegiate Football autographs are found in several forms with print runs no higher than 199. Black Gold Autographs utilize a trapped, on-card signature in gold ink for top 2016 NFL Draft players like Carson Wentz. Combining a jumbo jersey and gold signature, Autograph Jersey and Sizeable Signatures Jersey both offer top collegiate options. There are also quite a few relics to collect in 2016 Panini Black Gold Collegiate Football, all with a max print run of 199 copies. Golden Opportunity Shadowbox Memorabilia cards feature the 2016 rookies and limited versions include the one-of-one Tags. 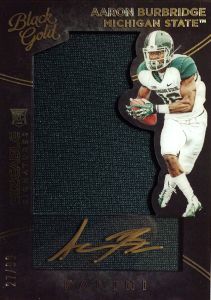 Massive Materials incorporates a jumbo swatch while Shadowbox Swatches highlights NFL rookie with a small relic piece. White Gold Prime and Super Prime parallels are numbered to ten or less. A staple of the Black Gold brand, collectors can also find the manufactured relic logos in 2016 Panini Black Gold Collegiate Football. This includes Rated Rookie Symbol and Team Symbols numbered to 199 or less. Further rarity is provided with White Gold, Black Gold and Holo Gold parallels, each numbered to 99 or less. PARALLEL CARDS: White Gold #/75, Gold Foil #/49, White Gold Foil #/25, Holo White Gold Foil #/10, Holo Gold Foil #/5, Printing Plates 1/1. *Cards #13 and #59 found in Holo Gold Foil parallel only. PARALLEL CARDS: Gold #/25 or #/5, Black Gold 1/1. *Card #38 found in Black Gold Parallel only. PARALLEL CARDS: Prime #/25 or #/5, Super Prime 1/1. 43 cards. Serial Numbered #/99. PARALLEL CARDS: Gold #/25, Black Gold 1/1. *Card #124 not found in Black Gold parallel. View specific options with the full spreadsheet. PARALLEL CARDS: White Gold #/99, Prime #/25, White Gold Prime #/10, Super Prime 1/1. PARALLEL CARDS: White Gold #/49, Prime #/25, White Gold Prime #/10 (*Card #2 - #/5), Super Prime 1/1. *Card #2 not found in Prime parallel. View specific options with the full spreadsheet. 12 cards. Serial Numbered #/199. 28 cards. Serial Numbered #/199. PARALLEL CARDS: White Gold #/99, Black Gold #/25, Holo Gold 1/1. 35 cards. *Card #1 not found in parallels. PARALLEL CARDS: Prime #/25 or #/5, Super Prime #/5 or 1/1, Brand Logo #/2 or 1/1. Not all cards found in Brand Logo parallel. View specific options with the full spreadsheet. Great product, beautiful cards!!! A must have for the collection! !